Staying on top of your rabbit's litter is an important job for the responsible owner. Rabbit litter trays are a good way of managing pee and poop - encouraging a rabbit's natural instinct to litter in one particular area. 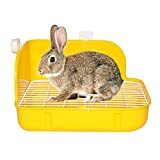 Managing your rabbit's hutch or range in such a way, also stops food and water stocks from becoming soiled. 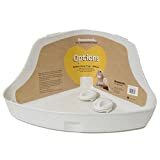 You will find a range of rabbit litter trays currently available for purchase from online retailers, alternatively, you could visit your local pet store. The bigger your rabbit, the bigger the tray will have to be. As a rule of thumb, your rabbit should be able to sit comfortably in a litter tray for it to be the right size. Often if the tray is too small, your rabbit will not use it. 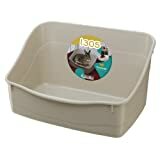 One of the most common designs of rabbit litter trays, are the corner tray. A corner tray lends itself to a rabbit's toilet behaviour, which involves backing into a corner and lifting up its tail! It's important that the tray has enough of a lip to help contain your rabbit's wet waste. It's worth noting that some pet experts believe rabbits are easier to litter train than cats! While we might like to read the newspaper on the toilet, your rabbit likes eat while taking care of its tail end business. With this in mind, it's a good idea to make sure some hay is in nibbling distance of the tray, so that your rabbit feels more at ease. When you're litter training your rabbit for the first time, you might consider treating it with a piece of carrot after each successful attempt. You'll need to layer the tray with a good quality, highly absorbent litter. You can choose from a wide selection online or seek advice at your local pet store. It's designed to keep your rabbit dry and clean, while also minimising odours. Nearly all pet litter brands market themselves on being both natural and biodegradable, and are designed to make cleaning out easy. Materials such as wood chippings and saw dust are widely considered to be less effective and should be avoided. A lot of rabbit owners prefer to clean their litter trays daily, but cleaning out once every thirty-six hours is acceptable. While hot soapy water is adequate enough, some rabbit owners opt for using additional pet cleaning products. Always make sure you rinse off well. A fresh litter tray can confuse your rabbit, so scent marking it with some of the old litter will restore its familiar scent. If you notice your rabbit toileting in different areas, often circling in the process, it might be down to territorial behaviour - common during puberty and among unneutered rabbits.